Non-member price is $1499.99. The “Members price” is $1349.00. Using CODE SK1772 at checkout knocks the final price to $1249.00 (plus tax and shipping). Here’s a super deal if you need a high-quality, high-magnification zoom scope for F-Class and long-range target shooting. Right now, the Vortex Optics Golden Eagle 15-60x52mm ECR-1 is on sale at Sportsmans Guide for $1249.99 (member price) with Coupon Code SK1772. That Code gives you a “double discount”. However, it will cost you $39.99/year to join the Buyer’s Club to get member pricing. You can cancel Buyer’s Club membership anytime. IMPORTANT: The $1249.99 Price is for BUYER’s CLUB only. And you MUST use CODE SK1772! Still a deal if you’re not yet a member? You bet. This same scope sells elsewhere for around $1500.00. For example the price today, 8/1/2017, at Amazon.com is $1499.00 (see below). If you figure you’ll pay at least $1490.00 elsewhere for this scope and you net out the $39.99 membership cost, we calculate you’ll still save $200.00+ by taking advantage of this deal. 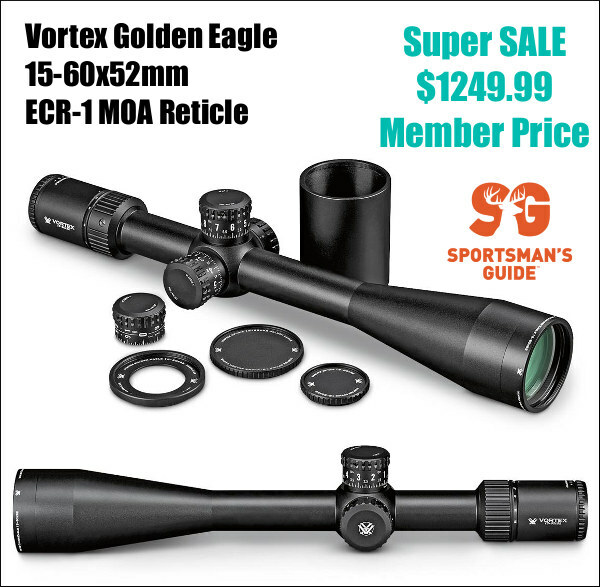 Share the post "Great Deal on Vortex Golden Eagle 15-60x52mm — Save $200"
Till mid August at Optic planet you can get same scope and choice of reticle for around 1200 and no membership fee. Check it out. Editor: NOT SO. At OpticsPlanet.com, the advertised price of All 15-60x52mm Golden Eagles is $1499.00. With Code SUMSAVE you do save 10%, or $149.90. That brings the price down to $1349.10. It’s still considerably cheaper at Sportsman’s Guide. But you’re correct, no membership required for the $1349.10 price with code SUMSAVE. Trade a fn 45 tactical for a vortex 15×60×52 for fn 45 tactical?